Update: Here’s a 25-minute video intro to Parallella. Parallella is a single-board supercomputer smaller than a deck of cards. While today’s fastest laptops contain four processor cores, Parallella has eighteen (2 ARM cores plus an Epiphany chip with 16 RISC cores). 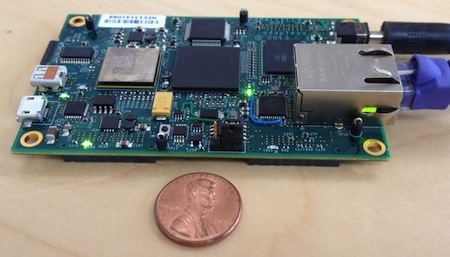 The maker of Parallella, Adapteva, is on a mission to democratize parallel computing. The company’s tag line is Supercomputing for Everyone. Everything in this post is based on the official quick start guide created by the Parallella team. These instructions are tailored for a Mac running OS X Mavericks (10.9.3) and a Parallella-16 equipped with the Zynq 7010 chip. I ran into some gotchas during my first Parallella experience. The snags (and solutions) are documented here. Micro-SD card, 16GB or greater. Desktop or laptop computer with a micro-SD card reader, or an SD-card reader with a micro adapter. These instructions are tailored for a Mac. A Linux or Windows machine will work with minor modifications in the procedure. High-speed internet connection, for downloading Parallella’s Ubuntu image and related files. Micro-USB-to-USB adapter, for the keyboard and mouse. Parallella is equipped with two micro-USB ports. Micro-HDMI to HDMI cable or adapter. Adapteva sells an accessories kit containing an SD card, power adapter, micro-HDMI to HDMI cable, and USB-to-micro-USB adapter. Unless you already have these items, buying the kit may save you time. Since you’re experimenting with Parallella, we can assume that you are an advanced user. Your computer is already backed up, or you’re running these steps on a test machine. And you know the power and pitfalls of sudo. Technology evolves rapidly, and everything you read here could change by the time you read it. How does the Parallella compare with other single-board computers, like the Raspberry Pi or Beaglebone Black? 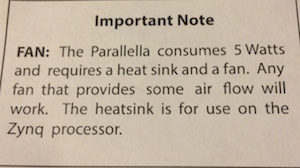 The first difference noticed at boot-time: Parallella runs hot! So hot, in fact, that the unit comes with a heat sink and the recommendation to add a fan. I’ve never needed a fan with a Pi or a ‘Bone. Of course, the Parallella runs hotter because it has more processing power packed tightly together in limited space. Since Parallella is designed to run tasks in parallel, we can expect certain programs to perform faster than they would on the Pi or ‘Bone. Future posts will explore Parallella’s performance using languages designed for concurrency, languages like Go and Rubinius. Now, let’s get started with Parallella. Parallella runs a customized version of Ubuntu installed on a micro-SD card. Burning the SD card takes a long time, so it makes sense to start that process first. Unzip the files and place them in a directory that’s handy. You’ll need them for the next step. With Mac OS X, you can unzip the files by double-clicking them in Finder. Note: You might need different files depending on the current date (Parallella software is in a rapid state of flux) and your exact equipment. If your configuration is different, you can make the adjustments described in Parallella’s official guide. Insert your SD card into your Mac’s SD card reader, and use the Mac OS X diskutil list command to determine the designation of the SD card. If you use portable hard drives with your primary machine, the SD card designation could change from time to time, so it’s important to perform this step each time you burn a card. From this diskutil report, we can see that we want to burn the SD image to /dev/disk1. The other device is the hard drive for my primary machine. Burning the wrong device means destroying data. Change into the directory where you downloaded the Ubuntu image. Unmount the destination partition on the SD card. Use the the dd command to copy the Ubuntu image to the SD card. The Mac section of the official Parallella guide recommends a block size of size of 1 megabyte, while the Linux instructions recommend 64 kilobytes (the option bs=64k in the dd command). I initially used bs=1m on my Mac, and I ran into problems. When I used bs=64k, everything worked fine. Note that I eventually traced my problem to something other than block size (details below) but since the 64k setting still works, I’ve left it intact. If I find out why Linux and OS X are using different block sizes, I’ll post the information here. Waiting an hour for the dd command to run can be disconcerting because the machine does not give any feedback on progress. No gas gauge, spinning indicator, nothing. How do we know if the write process is working? Here’s how to check progress. Run Apple’s Activity Monitor, and look for dd on the list of processes, as shown in the Activity Monitor screenshot. The number of bytes written will increase slowly while dd burns the Ubuntu image onto the SD card. With the current version of Ubuntu, roughly 7.4GB will be written to the SD. At completion, dd will disappear from the Activity Monitor list and you’ll see the following at the command line. As you can see from the report, it took 3363.824531 seconds (just over 56 minutes) for dd to burn the Ubuntu image onto the SD card. That’s a long time to wait with zero feedback. Activity Monitor will tell you what’s going on. To confirm that the partitions have been created and that Ubuntu has been written to the SD card, use diskutil list again. As expected, /dev/disk0 remains unchanged. We want it that way because that’s where our primary machine’s operating system resides. /dev/disk1 (your actual SD card designation may be different) is the target disk we’re after. Two new partitions are on the SD card, a FAT32 partition named BOOT and a Linux partition. Next we need to copy some supporting files to the new BOOT partition. Now that Ubuntu resides on the SD card, it’s time to add the files that support HDMI video and the FPGAs. Here’s how. The additional files will need to be copied to /BOOT on the SD card. While it might make sense to reach the BOOT partition as /dev/disk1, you will actually reach it via /Volumes/BOOT. We target /dev/disk1 when burning the Ubuntu image, but to copy the supporting files we target /Volumes/BOOT. Both designations point to the same place, the SD card. Why the name switch? I don’t know why two different designations are used for the same SD card. I only know that it works. You can expect to see an update posted here if I find an explanation. Or if you have an answer, feel free to post in the comments below. Before we copy over the files, let’s see what’s on the BOOT partition on the SD card. drwxrwxrwx@ 1 rth   staff   512 Jul  5 23:44 .
drwxrwxrwt@ 4 root  admin   136 Jul  5 23:44 ..
First, change into the directory where you stored the additional Parallella files, and copy the FPGA bitstream file to /Volumes/BOOT. First gotcha: I made the mistake of simply copying the parallella_e16_hdmi_gpiose_7010.bit.bin file without renaming it to parallella.bit.bin. Parallella will only boot when it sees a file with this filename on the SD card’s BOOT partition. The original file name will probably change as the software gets updated. With each change, we will need to make sure that the file is renamed parallella.bit.bin on the Parallella. Obvious in hindsight, but it took me awhile to track that one down! Two files were decompressed from kernel-hdmi-default.tgz: devicetree.dtb and uImage. Change into the directory where the files were decompressed, and copy them to /Volumes/BOOT. 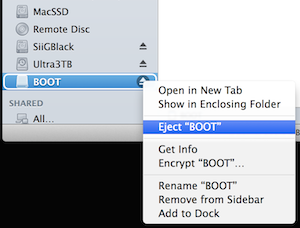 Here’s what the BOOT partition should look like when you’re done..
drwxrwxrwx@ 1 rth   staff     1024 Jul  6 12:14 .
drwxrwxrwt@ 4 root  admin      136 Jul  6 12:11 ..
Now you’re ready to eject the SD card from the Mac and insert it in the Parallella. Plug in the HDMI cable, keyboard, mouse, and Ethernet connection. Power up the Parallella, and welcome to the next gotcha. Parallella booted to a beautiful GUI, but the system would not respond to the keyboard or mouse. After swapping a few keyboard/mouse combinations, I finally tried a powered USB hub. The powered hub worked. Through trial and error I learned that the Parallella can handle a single keyboard plugged into the micro-USB port. However, if two devices are plugged in via USB, a powered hub is required. A passive USB hub will not work. A combination keyboard, one with both a keyboard and a trackpad, will also need a powered USB hub. … and Git works fine. If you want to take a screenshot of the Parallella display, use scrot. It comes with the Ubuntu installation. Type scrot at the command line and hit enter. Five seconds later, the entire screen will be captured and stored in a file called [time stamp]_1920x1080_scrot.png in the current directory. After waiting a year for Parallella to arrive, I’m excited to have the device up and running. Future posts will explore the “why?” behind parallel computing. Thanks Adapteva for helping to democratize supercomputing. Awesome times are ahead!